“What are all these teachers doing here?” more than one child asked as a group of nine adults filed into the classroom. “Just learning about the great learning you do,” we answered with a smile. “Shuffling up our professional learning,” I happily thought. Learning walks have shuffled our professional learning, moving us from our expected “spaces”, or rather classrooms, into our colleagues’ classrooms. This year to date our faculty has celebrated five learning walks (with more to come); in which a group of teachers visit classrooms in each of our grades K-5 along with one specialty class. Our purpose – to break down the isolation of educators, moving us into each other’s classrooms to notice and wonder about learning in our school as it is and as it might someday become. We plan to make it possible for every teacher in our school to participate in at least one learning walk per year. What on our learning walk looks different than it would have looked five years ago? What might look different on our learning walks two years from now? I posed these two questions during our learning walk debrief. It was the first time I had asked in quite that direct manner. The answers were insightful. What on our learning walk looks different than it would have looked five years ago? Whether in kindergarten or fifth grade, and indeed any grade in between, regardless of subject, we saw a similar sight – students spread throughout the classroom working in combinations of small groups, partners, and independently. 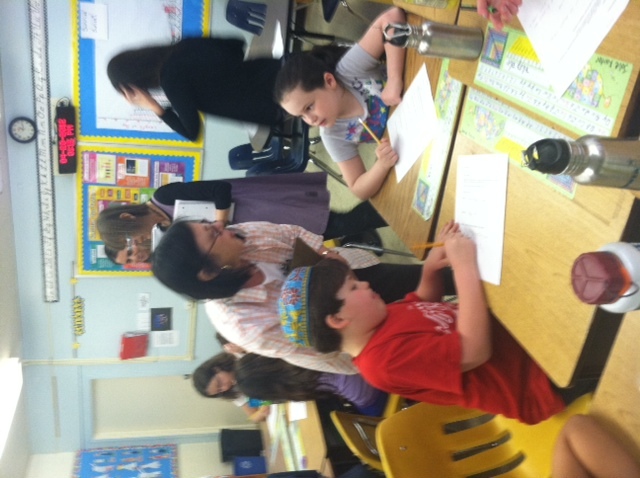 Teachers were either guiding a group or conferencing with individual students. In only one class, other than in physical education, were students participating in a full class experience and in that case it was a debrief on work they had been engaged in independently prior to our visit. Classroom furniture was arranged to promote collaborative learning and there were comfortable corners for students to read independently or with a partner. There was a relatively noisy buzz of students speaking with one another. 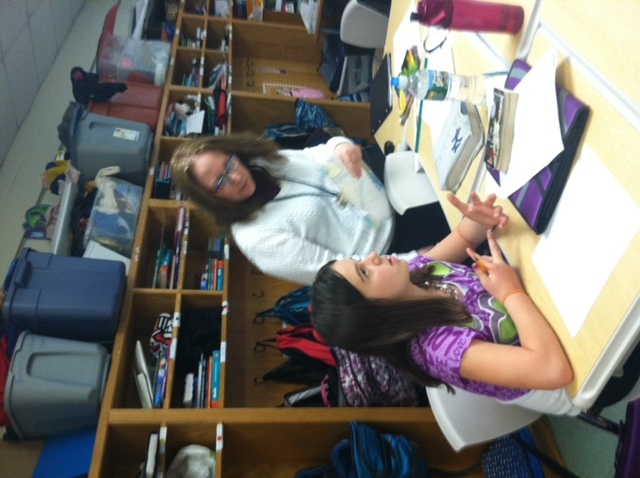 There was a mix of required learning activities and opportunity for student choice among various options. There was ample evidence of differentiation and student engagement, the two foci of our learning walks to date this year. Five years ago, had we participated in learning walks, we would have observed far more full class experiences led by the teacher and far fewer opportunities for students to choose from among different learning experiences. While interactive white boards are in each class in the school, in many classrooms we visited they were not being used. Students did not have technology, whatever the specific device, flexibly available for their use. Bulletin boards, for the most part, displayed class expectations and learning resources important all year, as well as substantive, completed student projects which might or might not be connected to current learning experiences. Bulletin boards did not, for the most part, display the most recent student work along with rubrics explaining specific learning goals, with expectations and resources that change as student progress unfolds. Two years from now we anticipate seeing on our learning walks many more technology tools (whether iPads, laptops, or other devices) available to students in our classrooms, not merely in our computer labs and media center, actively utilized in fluid, flexible organic ways to support student learning. We anticipate seeing evidence of student work in progress, along with rubrics and shifting resources based on student progress prominently displayed and recognizable as the basis for instructional choices, with the spot light visibly on student work to drive instruction. We anticipate even more differentiation and opportunities for choice in learning experiences. While learning walks are non-judgmental, human emotion and our passion for our craft are not ignored. We huddle in the hall after each classroom visit and reflect using the prompts, “I noticed”, “I wonder”, “What if” and “How might”. The reflections create an opportunity for celebration – joy in our progress along with excitement about possibilities for continued growth. We notice what we value. Our recognition of evidence of differentiation and student engagement, the two foci for our learning walks to date is potent. Similarly, our ability to imagine a not so distant future with greater educational technology integration and more substantial focus on student work in progress to drive instruction speaks to our self-awareness as professional learners and reflective educators able to envision learning goals not yet accomplished. Just as a strategy of good readers is to visualize what they read, a strategy of good educators committed to growth is to visualize school as it might become. By filling in the prompts “I notice”, “I wonder”, “what if?” and “how might?”, our learning walk shuffle not only brought us into “spaces” in our present reality, classrooms of our colleagues, but also shuffled us through the boundaries of time, bringing us to “spaces” of our future, enabling us to envision what we anticipate we will notice on learning walks of our future. Those images fill us with excitement and energy. “Doctoral confessions” is a series of stories started by my twitter friend, Will Deyamport (@peoplegogy) on the good, the bad and the ugly in pursuing a doctorate. Will, currently in the final stages of his doctorate, refers to those of us who have graduated as “brave souls”. I think it’s more honest to call us “persistent souls”. There are surely much more difficult experiences in life than pursuing a doctorate. Getting a Ph.D. doesn’t require bravery; just time and patience. I hadn’t intended to start a doctorate. It was the early 90’s and I was a rabbinical student, not yet sure how I would craft a career. I taught religious school as a means of supporting myself and found I loved being in the classroom; adoring the middle school students I taught. To improve my teaching skill, I added to my schedule as many education electives as I could. I found myself drawn to education. At the time, the field of Jewish education seemed to be expanding and there was great demand for qualified Jewish educators to serve in a range of settings. My school, The Jewish Theological Seminary, among other institutions was asked to produce doctoral students capable of becoming educational leaders. Apparently, I was gaining a reputation for holding educational promise. The chair of the education department, with whom I took a course, invited me to lunch. Would I be interested, he asked, in a full scholarship along with a living stipend to pursue a doctorate in Jewish education? It was an offer I couldn’t refuse. The experience was a dream come true. I continued rabbinical school, with the cost of classes covered as part of the same scholarship I received for my doctoral studies. I engaged in learning with professors and colleagues who stretched my thinking. I read countless books and journal articles that were meaningful and thought provoking. Do I have “war stories” – the bad and the ugly as it were? Well, of course I do. There was the German exam I failed miserably, finally squeaking through the language requirement with a B- (by the skin of my teeth) in two semesters of German. There was the moment I and three colleagues in my program approached our department to schedule our comprehensive exams, following six months of intensive study, only to be told the department had a new literature list and we would need to begin our exam prep anew. We protested that decision and were allowed to take the exam on the material we had initially been told to learn. There were the demanding years of intensive writing, critique and revising. Through it all, I always felt privileged both for the opportunity to learn and for the potential to contribute. Now, looking back 14 years into the past, the pain of grueling hours, days and years of writing almost forgotten, I wonder whether the intensive academic study prepared me for real challenges in real schools. Hubris aside at being able to call myself Dr., I question whether the study made me a better educator today than I would have been without pursuing the doctorate. I suppose the answer is yes – my academic training has helped me become a more effective educator. I can read and apply educational research utilizing critical thinking honed in my doctoral program. I can ask good questions. I can research and I can write. I can assess the quality of data and utilize data to formulate hypotheses and opinions. I can recognize the possibility of multiple interpretations of the same data. I am open to differing perspectives. And, I suppose the answer is also no – my academic training is not primarily what makes me an effective educator. I wasn’t prepared to support a child excluded by peers or frustrated by work that is too challenging or not challenging enough. I wasn’t instructed in ways of assisting a parent saddened by a child’s difficulties or angered by a school decision. I wasn’t shown ways of empowering teachers stiving to meet ever rising demands. I wasn’t made ready to allocate insufficient financial resources during economically trying times. Perhaps most significantly, I wasn’t equipped to lead the cultural change required in response to the rapid changes our world has experienced in the past fourteen years since I received my Ph.D. All of that I have learned from experience. Was receiving a doctorate worth the effort? Absolutely! Was it sufficient? Not by a long shot. Are there other paths to becoming an effective educational leader? Of course! Am I still grateful for the opportunity I received? Unquestionably; grateful and ever-committed to utilizing the gifts given me in order to make a contribution for the sake of our children.